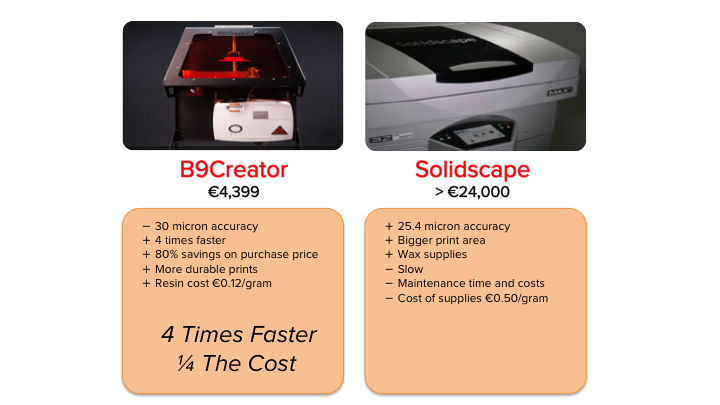 The B9Creator v1.2 HD 3D printer prints 4 times faster and is at least 1/4 of the cost of the Solidscape printer! Solidscape printers have a reputation of being expensive to operate and maintain. On the other hand, the B9Creator has very low operating and maintenance costs and replacement parts can be purchased online and installed easily. In some instances the maintenance cost on the Solidscape = the cost of a new B9Creator. Some jewelers have taken the money they would have spent on their Solidscape’s annual maintenance and bought a new B9Creator! In the time it takes to do one print run on the Solidscape, you can do 3 to 4 print runs on the B9Creator! The prints from the B9Creator are more durable than the wax prints from the Solidscape printer so there is no need for delicate handling and you can relax when handing the print over to your customer. The B9Creator and Solidscape can be used in conjunction. One customer uses the B9Creator to quickly and affordably print out customer proofs and reserves the more expensive Solidscape prints for the final design. If you need to save time and money with your custom jewelry business, the B9Creator will be a valuable addition to your new or existing line up of 3D printers. 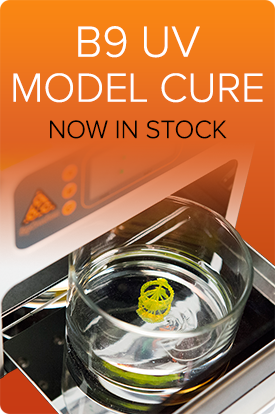 Who doesn’t want a 3D printer that is 4 times faster and 1/4 of the cost?